When you are confident, you are on top of your game. Self-Confidence is the difference-maker when it comes to performance. Self-Confidence separates the awesome from the average, the resilient from the stuck and the emotional masters from the emotional disasters. If confidence is such a key ingredient to positive peak performance, why does it seem so elusive to so many athletes? First, let’s identify a working definition of confidence, then identify the things that affect confidence the most. After you understand the biggest influencers to confidence, you can build strategies designed to grow positive, stable self-confidence. Self-confidence is your level of belief in your ability and efforts to achieve your goals and be successful in your sport. Self-confidence does not come from awards, praise or rave reviews in newspaper articles. Though these may validate your ability to perform and generate some feel-good emotions, these outside sources are fleeting. As the name suggests, self-confidence comes from within. 1. Self-Talk – Are the statements you say to yourself primarily positive or negative? If you verbally beat yourself up and highlight every mistake you ever made, confidence will wane. If your self-talk is uplifting and you recognize your strengths, your confidence will be high. 2. Defining Moments – Do you define yourself by your successes or by your failures? Recognizing and giving yourself credit for your successes and the things you do well help maintain positive healthy self-confidence. 3. Preparation – Do you put in the required work and preparation to perform at a high level during competitions? Mental and physical training and practice are essential in the development of self-confidence. The more prepared you are, the more confident you become. It’s just like school, if you have studied a lot for a test or you know the material, you are confident you will score a high grade. Preparation breeds confidence. If you want to see how confidence works at the elite level, look no further than WTA player CoCo Vandeweghe. 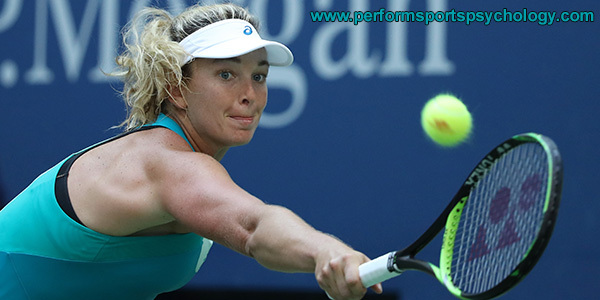 Vandeweghe was a wild-card entry at the 2018 Porsche Tennis Grand Prix in Stuttgart. Vandeweghe remained confident despite being a wild-card entry and it showed in how Vandeweghe played. Vandeweghe defeated the defending champion Laura Siegemund and three top-10 players, including a huge upset over world No. 1 Simona Halep, 6-4, 6-1, during the tournament to earn herself a spot in the finals. After Vandeweghe crushed top-ranked Simona Halep, she made a statement that demonstrates exactly how confidence grows. When you give yourself credit for your strengths and when you reward yourself for your successes, you infuse yourself with a big dose of confidence. Just because you perform confidently in a competition does not mean that you will feel confident all the time. Confidence is something you need to feed for it to grow. Take 5 minutes each morning to point out your good traits or relive some of your athletic successes. Give yourself a pat on the back for the development of your strengths and the accomplishments you have earned.